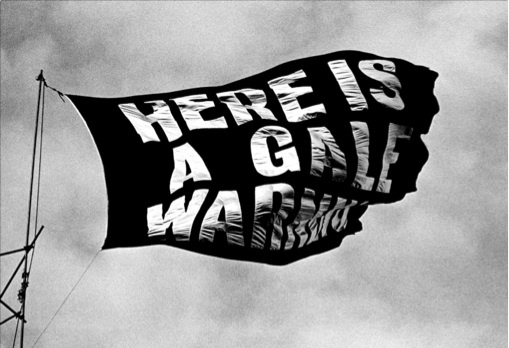 Here is a Gale Warning was conceived as a flag, made by the artist from silver tissue and black bunting, and measuring 6.70 x 9.0 m. The flag was installed on Alexandra Palace, London, 1971, as part of a survey exhibition of London artists entitled Art Spectrum London. One of a set of 5 prints published by the artist and Richard Saltoun. Printed in 2011. Each print is accompanied by a signed and numbered label. Price stated for complete set of 5 prints and is inclusive of VAT.